The latest article in Nursing Standard’s series celebrating modern nursing roles across the UK focuses on nurses in the Yorkshire and the Humber region. 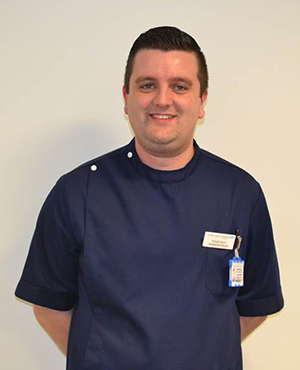 Richard Bunn is acute hospital liaison nurse for learning disabilities, Mid Yorkshire Hospitals NHS Trust. Since pathways for people with learning disabilities were introduced in January, there have been no failures in surgical procedures. ‘People with learning disabilities (LD) are often misunderstood because of their behavior – staff sometimes think the behaviour is a result of the LD rather than the person being unwell. ‘The majority of my work is with acutely ill inpatients, and I see around 14 inpatients across three hospitals every day. I am also notified when a person has a date for theatre so I can make any necessary arrangements. I visit patients at home, observe their behaviour and look for triggers. ‘For example, I was told that one man would remain calm if he could pop balloons, so when he arrived at the hospital the staff had filled the waiting room with balloons. ‘I have been instrumental in developing four pathways to give patients the smoothest possible journey through the hospital. Pathway 1 is for people who just need someone to accompany them through theatre, pathway 2 is for more anxious people who may need sedation and pathway 3 is for those who may need sedation at home. People we cannot get near the hospital are on pathway 4, which means they must be sedated at home and brought straight to theatre. ‘Since the pathways were introduced in January, we have had no failures or surgery cancellations. The hospital is also getting better at initiating the pathways without me so I can get involved in the more difficult cases. ‘I provide LD awareness training, and have developed a care plan for nursing staff on how to complete a capacity assessment and make a best interest decision. We have also introduced safeguarding measures. When a patient attends the emergency department we can see previous attendances, and if they have been three or more times in a year, we look at why. If we get a few people from the same home we can identify that home to the wider team. ‘Although my role is recommended by LD charity Mencap and the Confidential Inquiry into Premature Deaths of People with Learning Disabilities, it isn’t a requirement and some hospitals don’t have anyone doing this job. 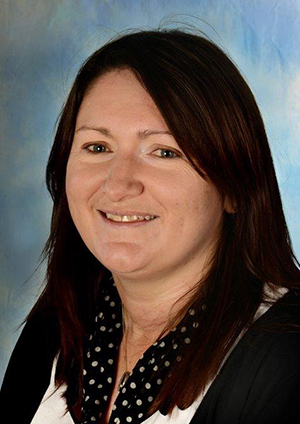 Rebekah Matthew is an integrated pathway manager, Sheffield Teaching Hospitals NHS Foundation Trust. She developed the Okay to Stay plan to enable patients with complex long-term conditions to stay at home. ‘I wanted to find a better way to support patients at home, even if they become unwell, so in July last year I came up with the ‘Okay to Stay’ plan. ‘I pulled together a workshop with geriatricians, ward matrons, hospital and community therapists and nurses, GPs and the Yorkshire Ambulance Service. Everyone was enthusiastic and started to develop the Okay to Stay plan. ‘This is a simple document drawn up by a community health professional with the patient. As well as including vital medical information, it paints a picture for any visiting health professional of how the patient manages at home, who supports them, and what medication they need if unwell. It also helps the patient to recognise an exacerbation of their condition. ‘The plan, which is accessible via our Single Point of Access, is reviewed every three months. The patient retains a printed copy to give to paramedics, the ambulance service or emergency department staff. ‘Some patients have access to Florence – a simple telehealth system – so can monitor their own blood pressure or oxygen saturations. If anything is outside a pre-set normal range, Flo texts back saying ‘take emergency rescue medications’ or ‘contact the community nursing team’. ‘If a patient calls the Out of Hours (OOH) service, staff are immediately alerted to their Okay to Stay plan. OOH staff can make a home visit with the plan, and make an informed decision to keep the patient at home. ‘The GP can then refer the patient to the 24-hour community nursing team or intermediate care service. ‘We have seen a 40% reduction in hospital admissions for the 36 patients in our pilot. We now have 50 patients and our target is 200 within a year. We estimate that up to 2,000 patients in Sheffield could benefit from having an Okay to Stay plan. This saves money and, more importantly, is better for the patient. 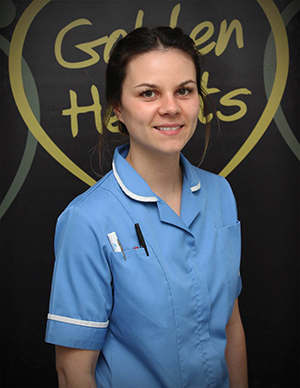 Sam Davies has been tissue viability link nurse on the neurosurgical unit at Hull Royal Infirmary for three years. During this time, she has set new standards of skin care. ‘When I was on a student placement here, a patient had a grade 4 pressure ulcer, down to the bone. This had a big impact on me, and when I qualified I volunteered to be the tissue viability link nurse. I’m self-motivated and had lots of ideas. ‘To provide staff with the best possible information, I shadowed tissue viability specialists and community nurses in my own time. ‘We may see very few leg ulcers on the unit, but we need to be able to treat them when we do. ‘The trust wanted to include bedside training along with classroom and online courses, so I developed questions for neurosurgery staff. This included asking them to demonstrate a correct logroll, explain how they would protect a patient’s skin, and how to use barrier sprays and creams. ‘Many of our patients are on flat bed rest for three months, and we have to logroll some of them every two hours. In study sessions I show pictures of pressure sores and ask staff to grade them. We discuss audit results, keep a pressure ulcer noticeboard and have a rolling training programme. I keep records and make sure all staff are up-to-date with training. ‘Tissue viability nurses say there has been a vast improvement since I took on this role. I look at things we struggle with in skin care and try to educate and push. I like teaching, increasing my knowledge and improving staff confidence, and I find it satisfying when I hear staff explaining what they need to do to treat a pressure ulcer. ‘Staff don’t come to me as much now because they know what to do. One patient who had to be nursed in an upright sitting position for six months developed a moisture lesion, but we managed to heal it and I was proud of that. ‘I’m sure patients don’t like their bum being looked at a million times by me but the last thing you want, on top of everything else, is a pressure sore.